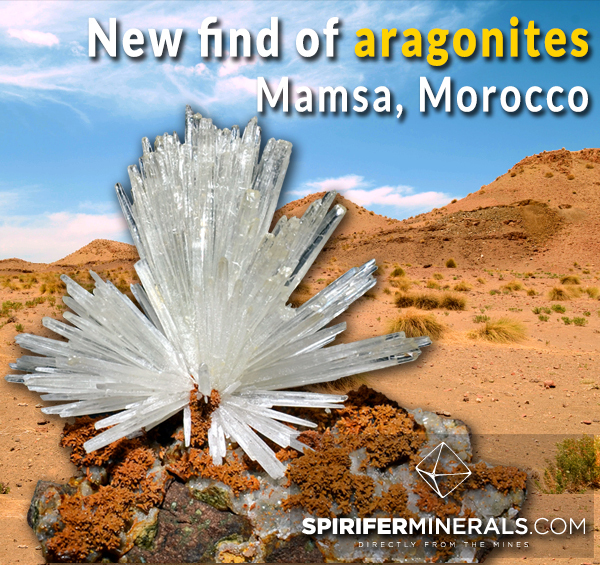 In April 2016 new aragonites from Mamsa (Sidi Ayed area, Midelt, Morocco) showed up on the market. The locality was discovered in March 2016 but it took over a month before miners organized and started mining. At the beginning it was only one group of three miners, but by May there were already three teams working with a total of around 10 people. 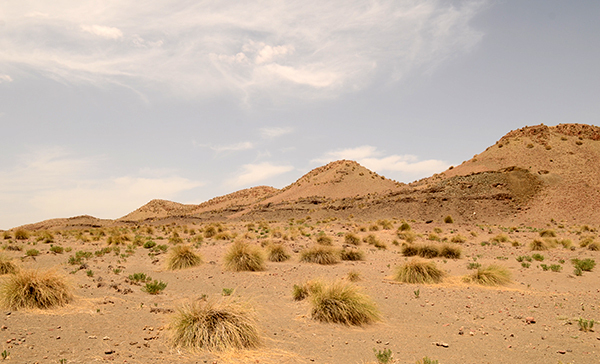 The Mamsa area is located on a semi-desert highland, with a very hot microclimate, and a lack of fresh water and because of this it is almost completely unpopulated. Miners who work there stay 2-3 days in the location, sleeping directly on the rocks. They use very simple mining tools, and are not very experienced. Unfortunately this results in a lot of damage to the specimens. Most of the people working in Mamsa used to dig agates, which the area is very famous for; Bou Hamza, a very well-known agate locality, is located very close to to Mamsa. Map of Earth with Morocco marked. 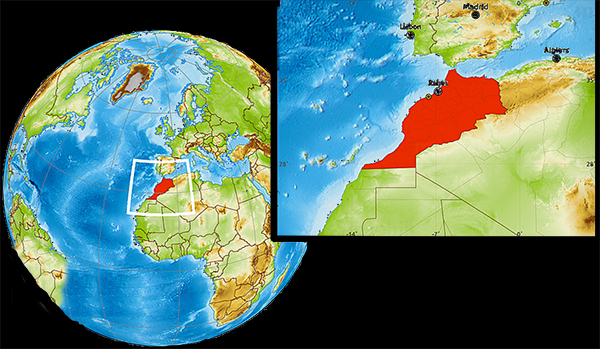 Map of Morocco with the Mamsa area marked. 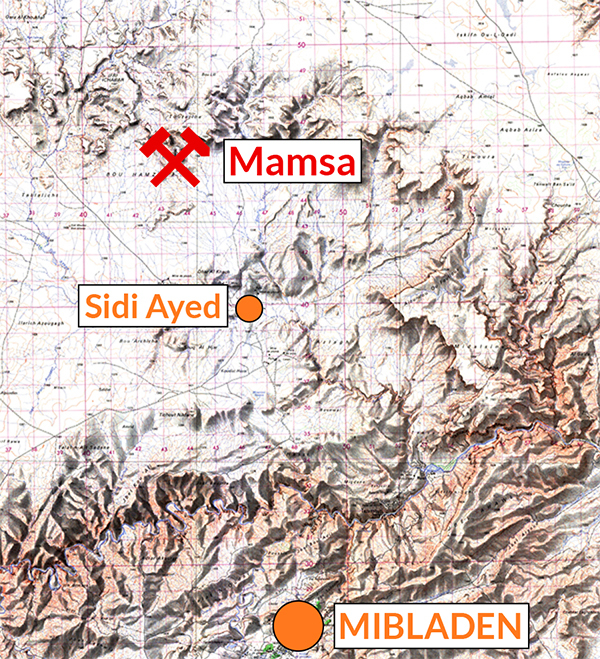 Map of Mibladen area with the Mamsa area marked. 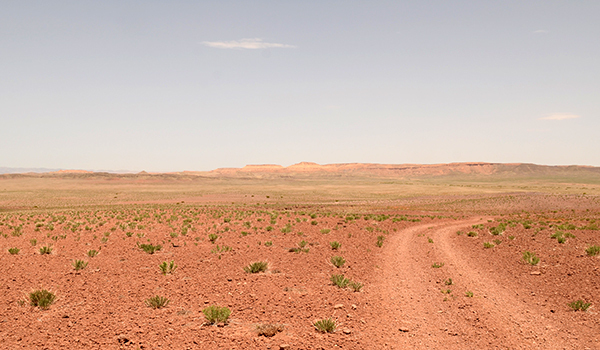 Mamsa on the horizon, semi-desert highland. T. Praszkier photo. 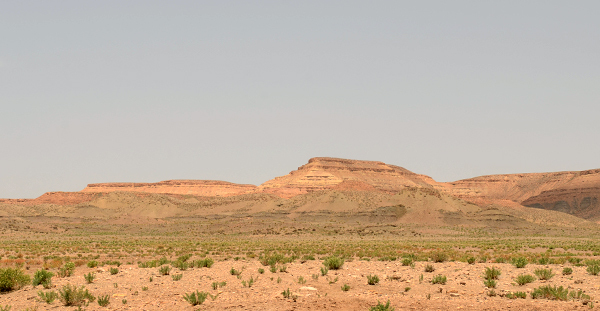 The Mamsa aragonite occurance is located in the greenish hills where the Triasic vulcanites occur, the higher hills (more orangish in color, and located further from the photographer) are built by Cretaceous sediments. T. Praszkier photo. The Mamsa aragonite occurance is located in the greenish hills where the Triasic vulcanites occur, the higher hills (more orangish in color, and located further from the photographer) are built by Cretaceous sedimantary rocks. T. Praszkier photo. 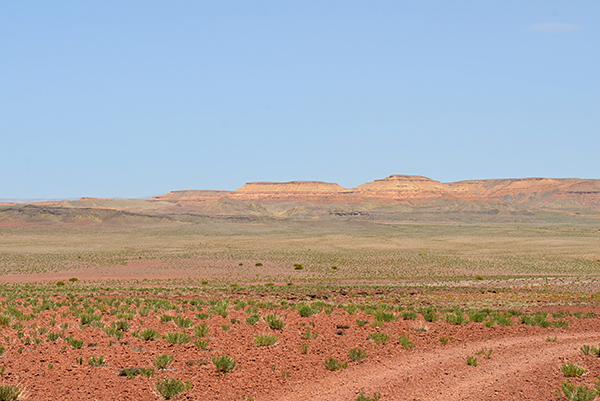 The aragonite locality is a natural outcrop of a Triassic volcanic sequence, comprising mostly tuffs and melaphyres. 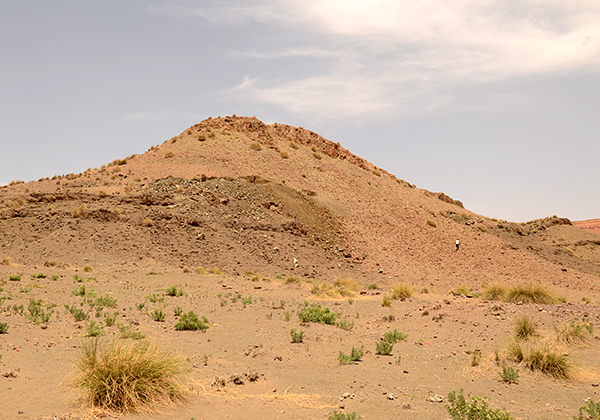 The outcrop takes the form of a series of small, elongated hills with almost no vegetation. 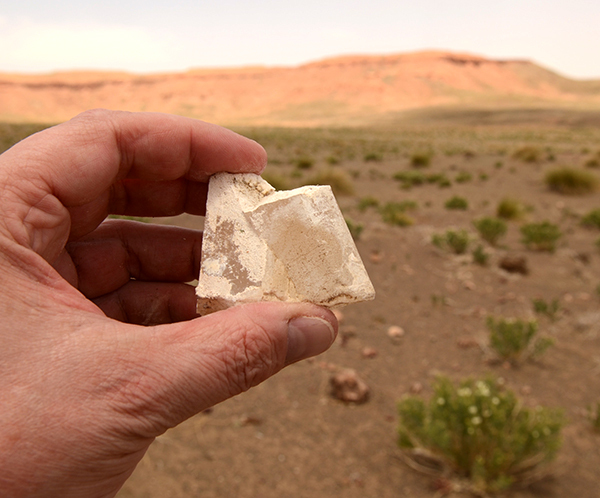 Rocks containing aragonite are exposed along a distance of about 500 metres. 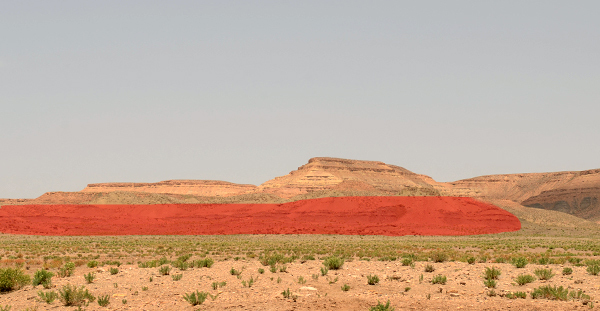 Pockets containing good quality aragonites occur in the higher part of the hill, in one of the harder melaphyre layers. 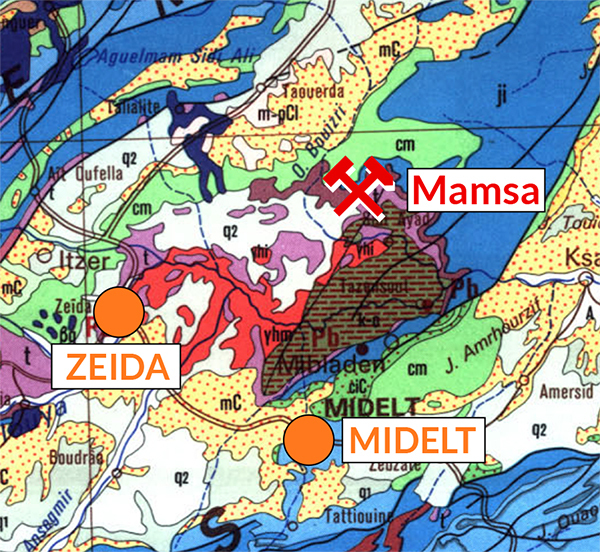 Geological map of Midelt area with the Mamsa location marked. The area marked in red is a zone where aragonites occur in Triasic vulcanites. T. Praszkier photo. The natural outcrop of vulcanites with distinctive bedding in Mamsa locality. T. Praszkier photo. The natural outcrop of vulcanites in Mamsa locality. T. Praszkier photo. Numerous agate and jasper veins are present in the area. T. Praszkier photo. The workings with aragonite. T. Praszkier photo. The miner splitting blocks of rock in search of pockets. T. Praszkier photo. The biggest of the pits and the source of the best quality specimens so far (May 2016). T. Praszkier photo. The size of the pockets varies from very small to 50 cm long and 30 cm high. They are usually very flat, with a discoidal shape, aligned parallel to the bedding. Most of the pockets contain just quartz and/or chalcedony. The size of the quartz crystals reaches up to 2 cm. In many of the pockets the quartz is partly overgrown by white, black, or brown calcite. Flat discoidal pockets, aligned parallel to the bedding. T. Praszkier photo. Flat discoidal pockets, aligned parallel to the bedding, most of them is coated with quartz and calcite. T. Praszkier photo. Freshly mined specimen of quartz with calcite coating. T. Praszkier photo. Fragment of the pocket with numerous, but low quality aragonites. T. Praszkier photo. Fragment of thick aragonite crystals found on the surface. T. Praszkier photo. The aragonite in most of the pockets is not well formed and is attached to both sides of the vugs. As the host rock is not very solid the extraction of intact specimens is difficult. This is the main reason why the vast majority of specimens is damaged or incomplete. Only a very small percentage of them is extracted as good quality specimens. Aragonite occurs in three distinctly different morphologies, and calcite pseudomorphs after aragonite have also been recovered. The most common form of the aragonite crystal clusters is as sprays or radial aggregates of white needle-like crystals. Usually they are 1-2 mm thick and 3-5 cm long. The size of the aggregates varies from 3 to 8 cm. They are usually white or colorless, and translucent with poor to moderate luster. They are especially showy when they occur on contrasting brown or black calcite. 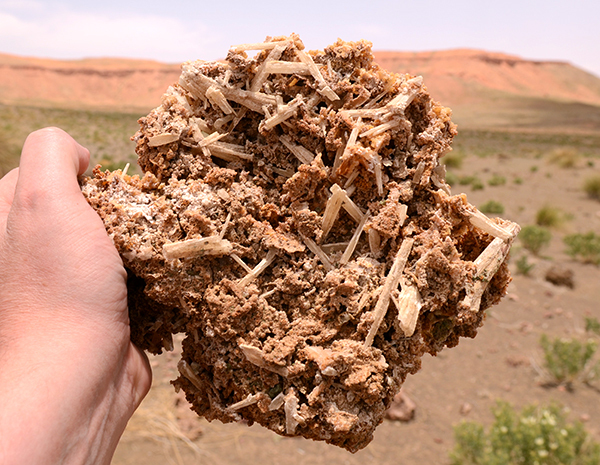 Because of their fragility aragonite clusters of this habit are usually heavily damaged, with very few of them complete. The author has examined several hundreds of specimens of this type and only 30-40 of them were undamaged. Spray of needle-like aragonite crystals on calcite - the most common and spectacular habit of specimens from Mamsa, size: 8 cm. J. Praszkier photo. Spray of needle-like aragonite crystals on calcite - the most common and spectacular habit of specimens from Mamsa, size: 13 cm. J. Praszkier photo. Spray of needle-like aragonite crystals on calcite - the most common and spectacular habit of specimens from Mamsa, size: 9 cm. J. Praszkier photo. Spray of needle-like aragonite crystals on calcite - the most common and spectacular habit of specimens from Mamsa, size: 10 cm. J. Praszkier photo. Spray of needle-like aragonite crystals on calcite - the most common and spectacular habit of specimens from Mamsa, size: 7.5 cm. J. Praszkier photo. The second quite common habit of aragonite is as stubby, pseudohexagonal cyclic twins. Their length is up to 4-5 cm, usually around 2-3 cm, and they are 1-2 cm thick. Twin planes are clearly visible on the flat pinacoidal terminations. Some of them are quite lustrous (usually with a satin luster), gemmy and clean inside, but most show etching on the faces. In some cases this type of crystals form radial aggregates. Most of them are white or colorless, but in some pockets they are pinkish. Usually this type of aragonite occurs on dark calcite which provides a very good contrast to the specimens. Second habit of aragonites from Mamsa - stubby, pseudohexagonal cyclic twins, size: 10.5 cm. J. Praszkier photo. Second habit of aragonites from Mamsa - stubby, pseudohexagonal cyclic twins, size: 9.5 cm. J. Praszkier photo. Second habit of aragonites from Mamsa - stubby, pseudohexagonal cyclic twins, size: 6.5 cm. J. Praszkier photo. Second habit of aragonites from Mamsa - stubby, pseudohexagonal cyclic twins, size: 5.5 cm. J. Praszkier photo. Second habit of aragonites from Mamsa - stubby, pseudohexagonal cyclic twins, size: 9 cm. J. Praszkier photo. Second habit of aragonites from Mamsa - stubby, pseudohexagonal cyclic twins, FOV: 8 cm. J. Praszkier photo. Cyclic twinning visible on the pinacoidal termination of aragonite crystal. J. Praszkier photo. The third and rarest type of aragonites are long, prismatic, cyclic twinned crystals. Only a few specimens of this type have been recovered so far. 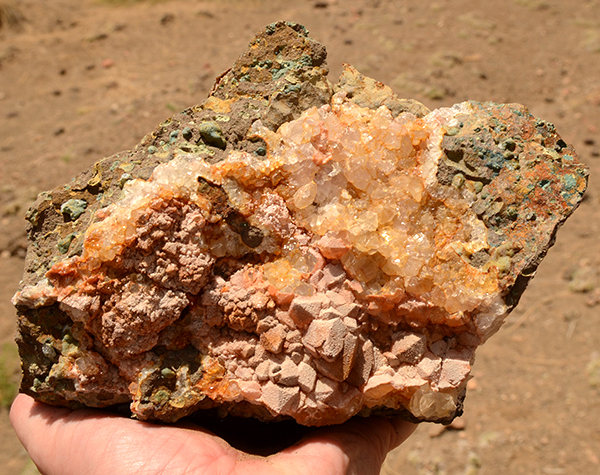 The best of them contain clusters of crystals to over 13 cm long, and about 1 cm thick. They are quite lustrous, gemmy inside, but with etching on the crystal faces, and irregular terminations. The rarest type of aragonite crystals - long, prismatic, cyclic twins, size: 13.5 cm. T. Praszkier photo. 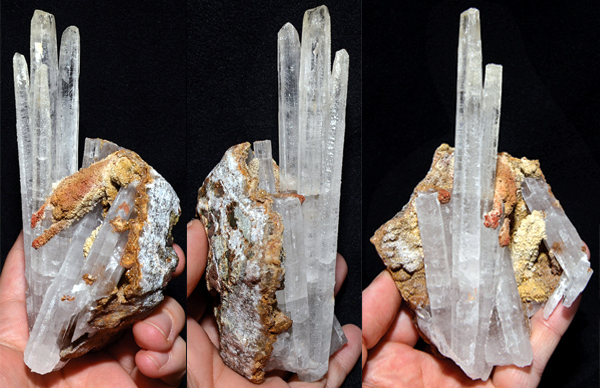 The rarest type of aragonite crystals - long, prismatic, cyclic twins, size: 8.5 cm. T. Praszkier photo. Beside these three habits, pseudomorphs of calcite after aragonite also occur. It appears that calcite replaces the twinned, thick aragonite crystals. The size of some of the pseudomorphs is very impressive, with crystals reaching as much as 20-30 cm in length with a thickness of 3-4 cm. Unfortunately this type of specimen is not attractive, with very coarse surfaces and poor aesthetics. Smaller pseudomorphs are very common, however, and in some pockets these are overgrown by younger aragonite. 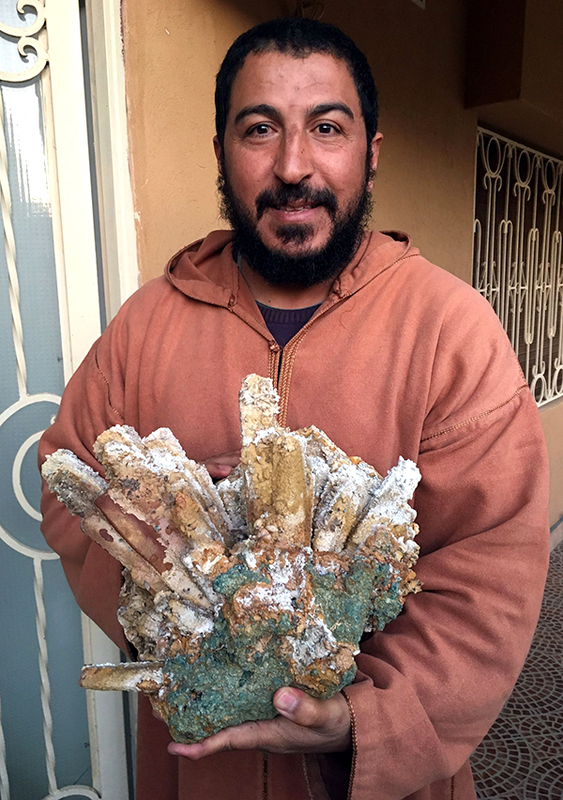 Giant pseudomorphose of calcite after aragonite, unfortunately not very aesthetic, kept by our friend Hamid. T. Praszkier photo. 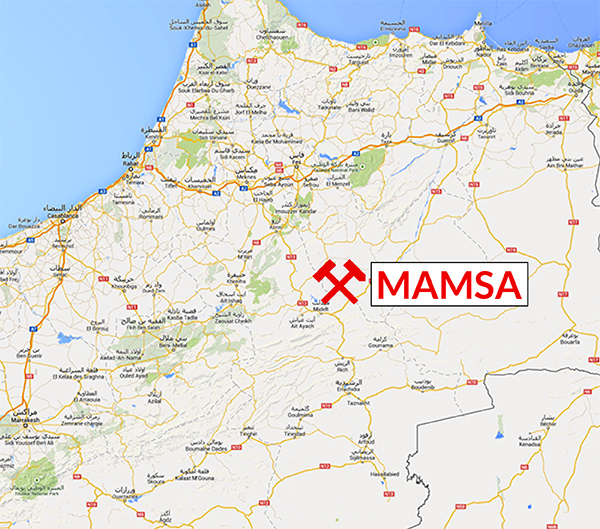 The potential of the Mamsa locality is considerable. The outcrop is extensive and miners have only just started to work there. Unfortunately using very primitive mining techniques exploitation from deeper parts of the volcanic rocks will get more difficult, and the potential for undamaged specimens is reduced accordingly. Special thanks to Malcolm Southwood for help with editing the article.